Ed Chambers was born in Whitehorse in 1935. He was the fifth child born to Susan Van Bibber (Dickson) and George Chambers. Ed was a mechanic and heavy equipment operator by trade. 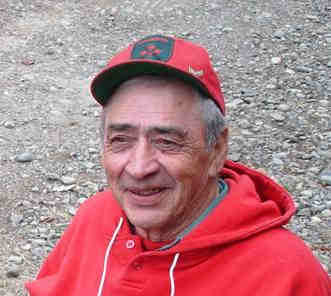 He had a reputation as being one of the best loader operators in Whitehorse and built many basements and foundations, including the current Takhini Hot Springs pool near Whitehorse. He operated his own business called Ed’s Construction (Yukon) Ltd. He taught his son, nephews, other relatives and friends how to operate and maintain heavy equipment and over the years many of his family and friends worked for him. While operating his business in Whitehorse, Ed also started the company Champagne Services in Champagne. He and his wife Frances eventually retired to Champagne, although ‘retired’ is not a word that one would normally use when speaking of Ed; he was always busy with various carpentry, plumbing, electrical or construction projects. When asked what he was up to, Ed would reply that he was “just puttering”. Ed and Frances had five children. The Chambers family lived for many years in downtown Whitehorse, where their door was always open to friends and family. If anyone had vehicle problems or was in need of a few dollars or a hot meal, they knew they could go to Ed’s house. The Chambers House is now listed as an historical building. Ed served on Yukon Energy’s Board of Directors from 1991 to 2004. As such he was one of the Board’s longest serving members. He took his appointment very seriously and was always insightful in his thoughts. He devoted a lot of energy and effort to ensure Yukon Energy followed what he felt was the correct path. Yukon Energy is extremely grateful to Ed Chambers for his years of service, and to his family for allowing us to name a scholarship in his honour.